With all the interest and activity in the abolitionist movement in Lowell in the 1840s – 1860s, I though that this personal letter written by President Abraham Lincoln would be of interest. It is from the MHS collection and was was posted today on the Massachusetts Historical Society website. There is an article along with the letter. 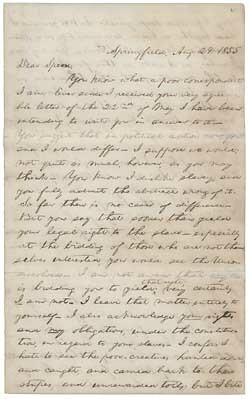 In this letter dated 24 August 1855, Abraham Lincoln, who had been defeated in an election for the United States Senate and was practicing law in Springfield, Illinois, writes to his close friend and confidante Joshua Fry Speed (1814-1882), setting forth his closely guarded personal feelings about slavery and the future of the Union should slavery be extended into the new territories.